Play Later is a feature in the Playground that lets you schedule games for future. It works as a regular game room but scheduled for a later time rather than appear in Play Now. You can plan the time and date up to 14 days ahead and let other people join if the time’s convenient for them. Also, you can add the events to your сalendar so that you don’t miss them and reschedule the events later. To join a game, click the game room > Join. Create a game room as usual. See Starting Games and Inviting Players. Check that “Visible to other players” is selected in Room Otpions. This is required for the game to be displayed in Find & Play. Choose the date (up to 14 days ahead) and time and enter an optional welcome message. Your scheduled game is ready! Also, you can change other room settings, like language, experience with the rules, etc. Click More options to access room settings. 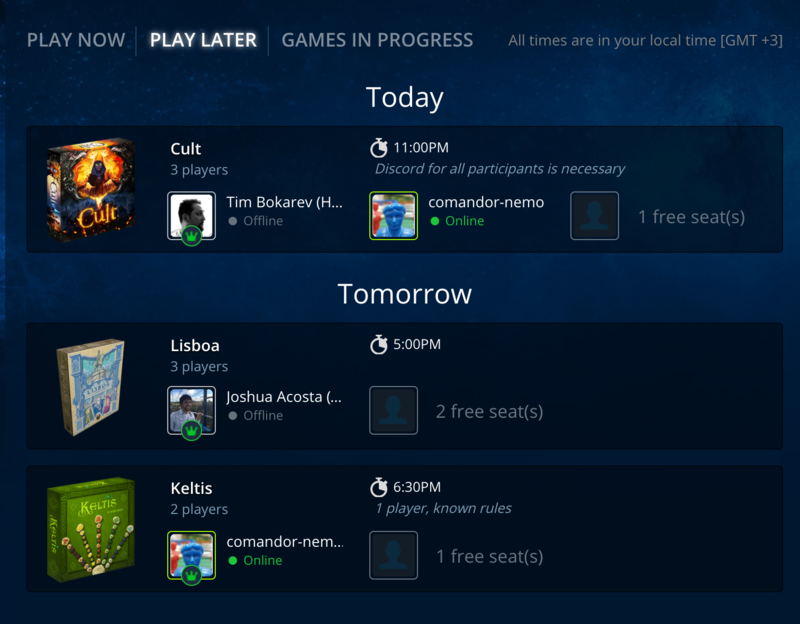 The game will be displayed in the Play Later section for other players to see and join. At the time of the event, you will need to start the game as usually once the players are assembled, see Starting Games and Inviting Players. If the game is not started, it remains visible in Play Later section for two more hours after its due time and then is deleted. To reschedule the game, enter the existing game room, click the date and choose another date and/or time. • Use Discord for voice communication. Enter the name of the chat room in the welcoming message for convenience. • Check the lobby chat from time to time before the game starts: other participants may have questions for you. There are several features that will ensure that you don’t miss your scheduled games. 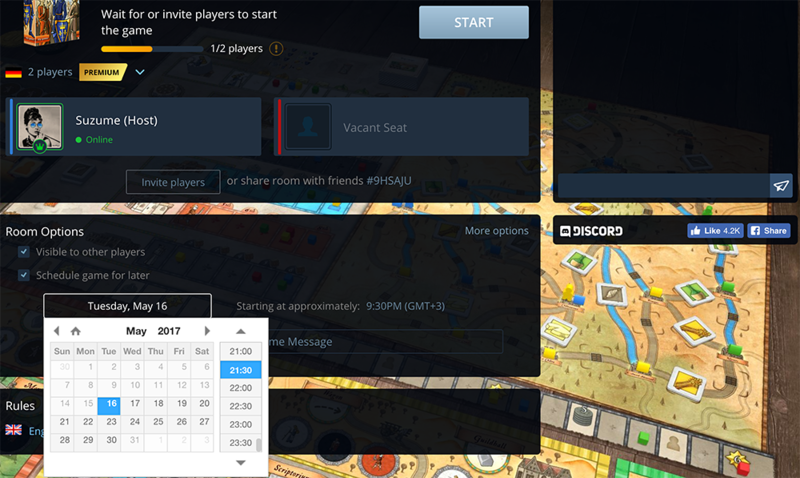 After creating or joining a scheduled game you can add the event to your calendar: click in the upper part of the game lobby and select a calendar. 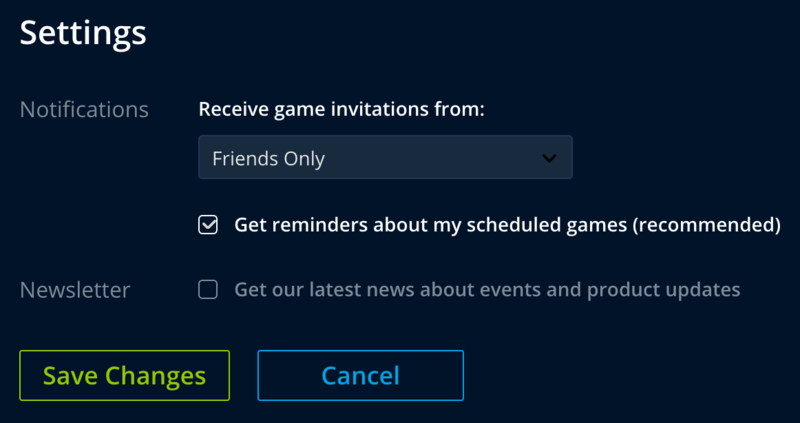 Uncheck “Get reminders about my scheduled games” if you don’t want to receive email messages about your upcoming games. Also, you will receive a web push notification in your browser 15 minutes before the game. You’ll need to enable such notifications from Tabletopia in your browser when asked.